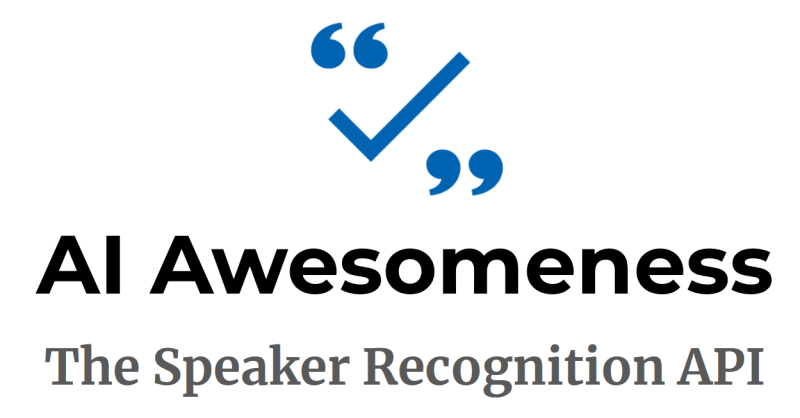 The Speaker Recognition API is made up of two parts – verification and identification. In my previous article we played around with the Speaker Verification API; this time it’s the turn of the Speaker Identification API. For this flavour, instead of repeating a preset phrase three times, a piece of audio up to 5 minutes long is used to determine a voice print for a given profile. From then on you are able to send a shorter segment of audio to the Speaker Identification API and receive a pretty speedy response containing a matching user’s profile id (if any) and a confidence level for the match. This won’t give you the high level of user confidence you might get from the verification endpoint, but it will give a handy “I think this person is talking” response. This time last year it was just US English and Mandarin Chinese, so in less than a year we’ve got twice as many languages supported for identification! That just gave us a new profile ID to use in the subsequent API calls for this profile. 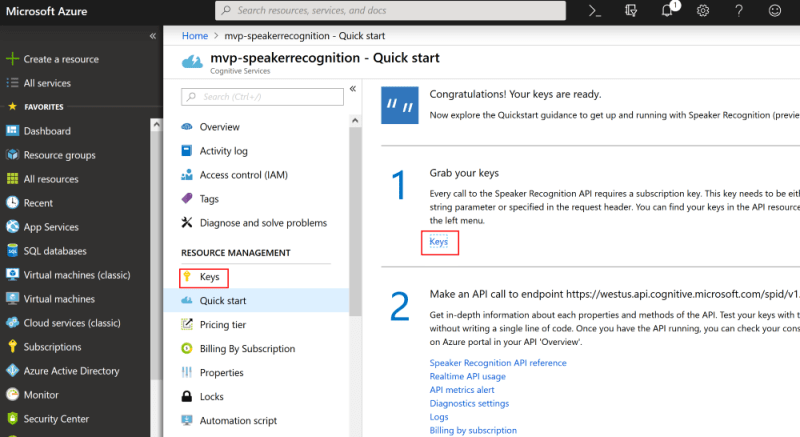 One key difference with the Speaker Identification API when compared to the Speaker Verification API is that instead of needing to repeat one specific phrase multiple times, we can just send a long piece of audio of the user’s voice – up to 5 minutes long – in one request, and let the Identification API do it’s magic in the background. Before we make this enrollment request, I’ll quickly point out the shortAudio querystring parameter; I’m using this to override the recommended audio length of 30 seconds and allow me to speed things up (but be less accurate). shortAudio allows us to use a minimum of 1 second of audio – however this will create a much less accurate voiceprint for that user. Perhaps remove this parameter if you’re finding the identification service not particularly accurate and be sure to pass in at least 30 seconds of audio after removing silence. As such you will need to pass in a few more than 30 seconds of audio to allow for breaks between words. As before, notice the blob in the request.send(blob) call? That’s the audio recorded via the browser, already encoded in the correct format; i.e. WAV container, mono (1 channel), 16K rate, 16 bit sample format. The details of how this was achieved are out of the scope of this article, since they’re specific to the Web Audio API and a custom version of the incredible RecorderJS, which can be found within my demo solution over on github. I honestly can’t remember all the changes I had to make to get this working as it was a lot of trial and error! The initial response will return immediately with a 202 HTTP status code, and a header called Operation-Location containing the url to ping for the enrollment status. The url in the Operation-Location header will let us know when that profile has completed the enrollment; i.e., the processing has completed and we have a voiceprint associated with the profile. // Woohoo! The audio was enrolled successfully! Notice the speechTime values; in my example I explicitly recorded for 15 seconds, but there was only 13.73 seconds of speech – this means any gaps between words, like taking a breath, are removed from the overall voiceprint. Make sure you take this into account when deciding how long to record for and whether you’ve used shortAudio or not. To make the next section more interesting I suggest you repeat this process with two or three more people, to have a few distinct profiles set up. Ok, let’s assume you’ve got two or three different identification profiles set up – now we can test it! In order to do that, we send a new chunk of audio to a slightly different endoint along with a list of profile IDs to ask which profile that audio matches (if any). 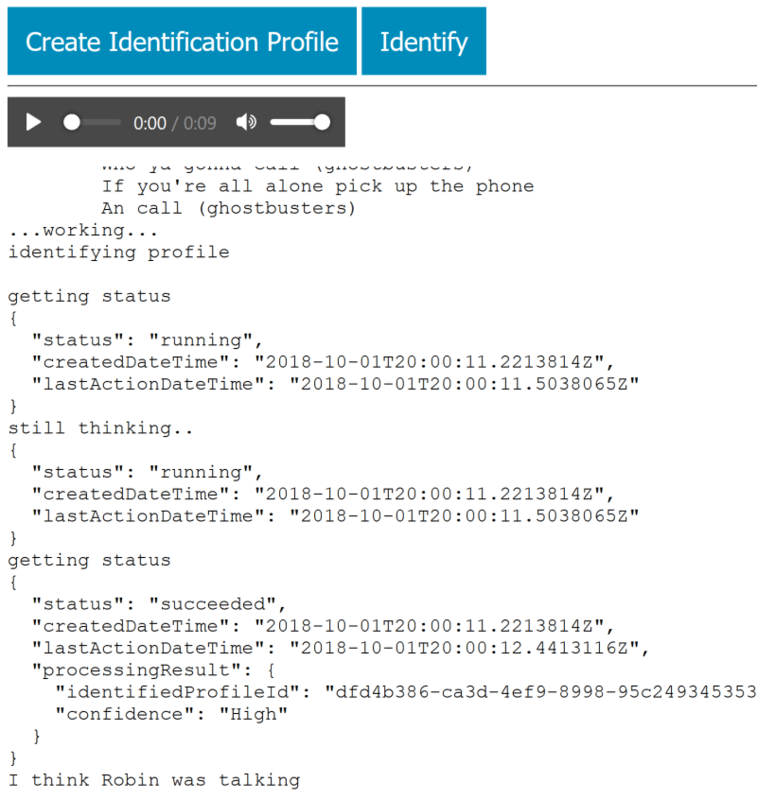 The person whose voice was used to create the profile referred to in processingResult.identifiedProfileId is who the Speaker Identification API thought was talking, and you get a confidence score thrown in for good measure as well! 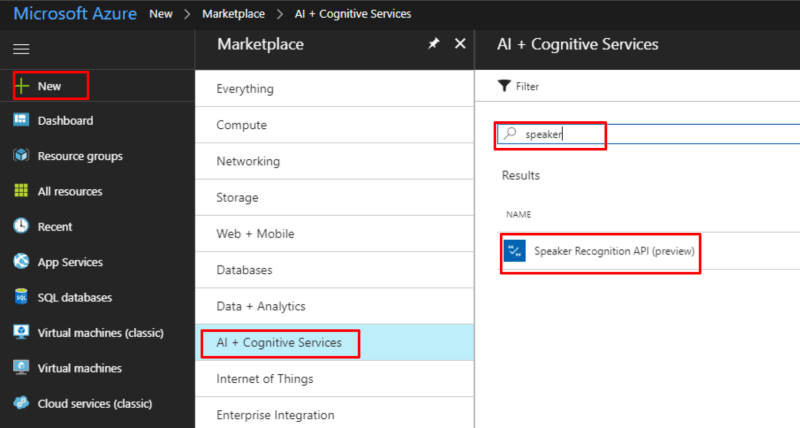 You can have a go yourself by checking out the github repo and playing with the demo; you just need to enter your cognitive services key in the box and tap GO. Then you can tap the “Create Identification Profile” button, watch the responses come through, give your profile a name (to make the identification response nicer), Create Identification Profiles for a few other people, then tap the “Identify” button to see if it can match you with your profile! Have a play around and let me know how you get on! The documentation for the Speaker Recognition API is your best stop for issues with getting it working. If you try out the demo and find the profiles aren’t matching very well, open a your browser’s debug console and type BurnItAll('identification') to delete all identification profiles associated with that cognitive services account; only do this when testing and playing around as it really will delete all profile voiceprints!